After I checked out the Sanborn maps, I took a walk around the Research Center. It is really important to become familiar with the lay of the land, to see what the site you are visiting offers. Although much of the material is kept in closed stacks outside of the main Center room, there are open bookcases along the walls. 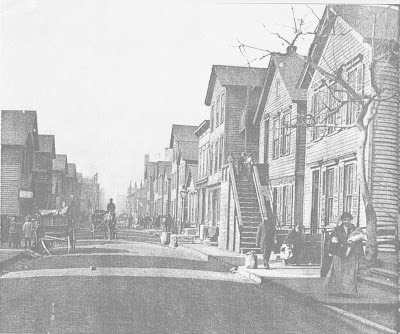 The Slum and the Ghetto: neighborhood deterioration and middle-class reform, Chicago, 1880 – 1930 was written by Thomas Lee Philpott, an Associate Professor of History at the University of Texas. Just by chance, I had found a reference that would give me new and chilling insight into the NearWest Side where my Irish ancestors lived in the late nineteenth century. I wrote about this area in my post of December 6, 2012 when I showed how Clara Laughlin described that area and time period of Chicago in her novel, Just Folks. Now I would have a view of my ancestors’ neighborhood from a historian’s perspective. The Maxwell Street area in 1906, from the Charles R. Clark Collection, in the folder for "Interpersonal Relations--Manners and Customs--City and town life--Slums--Illinois--Chicago--Near West Side. 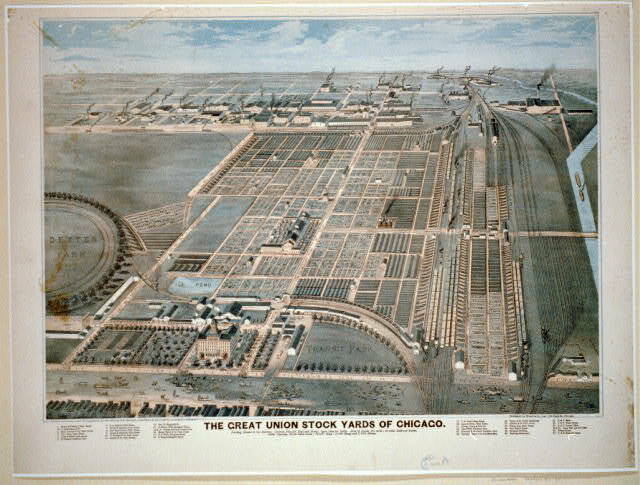 ", used by permission of the Chicago History Museum. of squalid living conditions that led to disease and death for a large number of people who lived in the tenements of Chicago. The Great Union Stock Yards of Chicago, 1870, Photo by Rascher, Charles, Chicago: Published by Walsh & Co., c1878, Wikimedia, public domain due to copyright expiration. Underwood & Underwood, photographer, c1906. 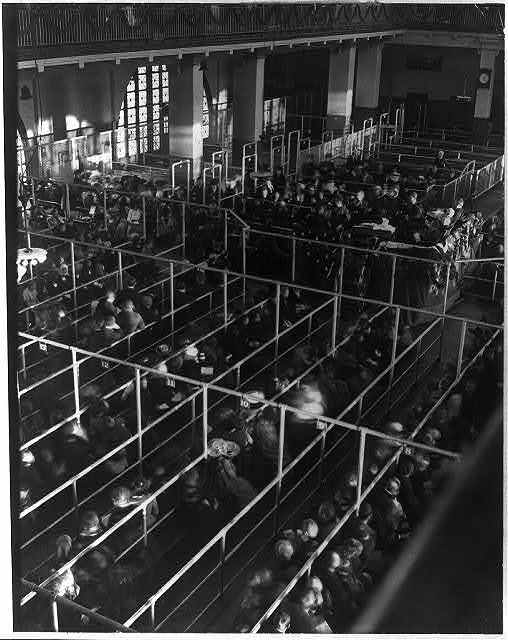 cph 3a23424 http://hdl.loc.gov/loc.pnp/cph.3a23424, [Emigrants in "pens" at Ellis Island, New York, probably on or near Christmas --note the decorations,] Library of Congress. 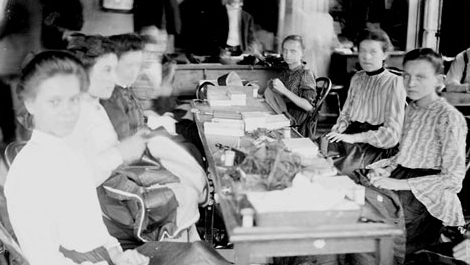 Image of eight girls sitting and facing a narrow table, sewing by hand on material held in their laps, during a sweatshop inspection in Chicago, Illinois. The girls are all looking at the camera, 1093. Courtesy of the Chicago Historical Society. Many of these refugees ended up in the tenements, and this added to the already deadly overcrowding. 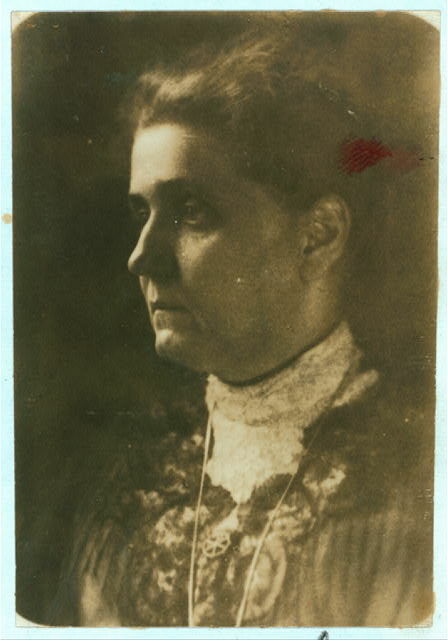 Jane Addams, Wikimedia, public domain due to copyright expiration. 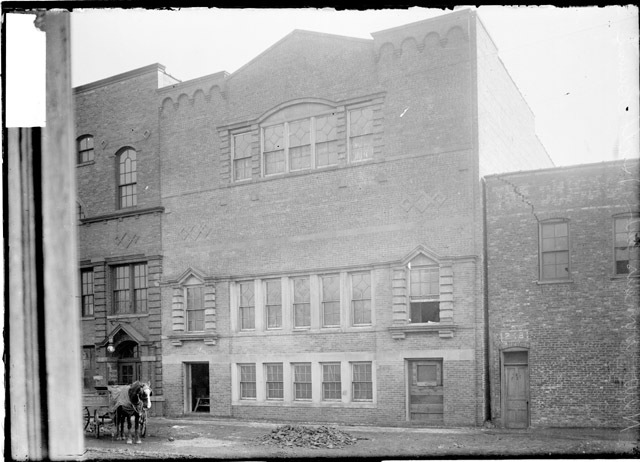 Hull House Women's Club building on Polk Street, 1905, Wikimedia, public domain due to copyright expiration. My own family history bears out what Professor Philpott observed. First my Irish ancestors showed up on the Near West Side around the 1860s. They lived on Halsted at Hastings. 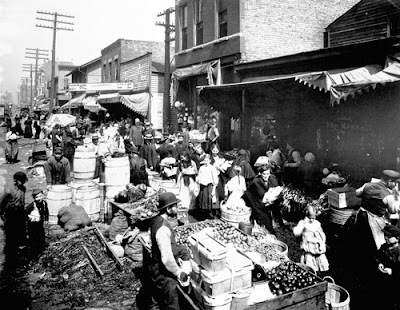 Then the Bohemian contingent arrived in the early 1900s and settled on Blue Island Street. One of the busiest streets in the world--State St., Chicago, Ill. (18 miles long), N. from Madison St. New York : Underwood & Underwood, publishers, c1903. Library of Congress Prints and Photographs Division Washington, D.C. 20540 USA. As I have learned more about the conditions my ancestors endured in the Chicago tenements, I realize once again the debt that I owe these brave people. It was through their sacrifices as they worked to gain a foothold in this country that I have benefited. Thank you to those who came before. 1. Thomas Lee Philpott, The Slum and the Ghetto: Neighborhood Deterioration and Middle-class Reform, Chicago, 1880-1930, The Urban Life in America Series (New York: Oxford University Press, 1978) p. 7. 2. 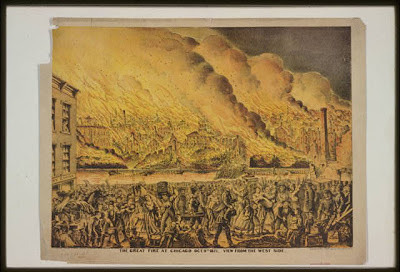 Fire of 1871, Encyclopedia, online http://www.encyclopedia.chicagohistory.org/pages/1740.html, downloaded 6 Jan 2013. 4. City Homes Association, Encyclopedia, online http://www.encyclopedia.chicagohistory.org/pages/289.html, downloaded 6 Jan 2013. 7. Tenements, History.com, online < http://www.history.com/topics/tenements>, downloaded 5 Jan 2013.